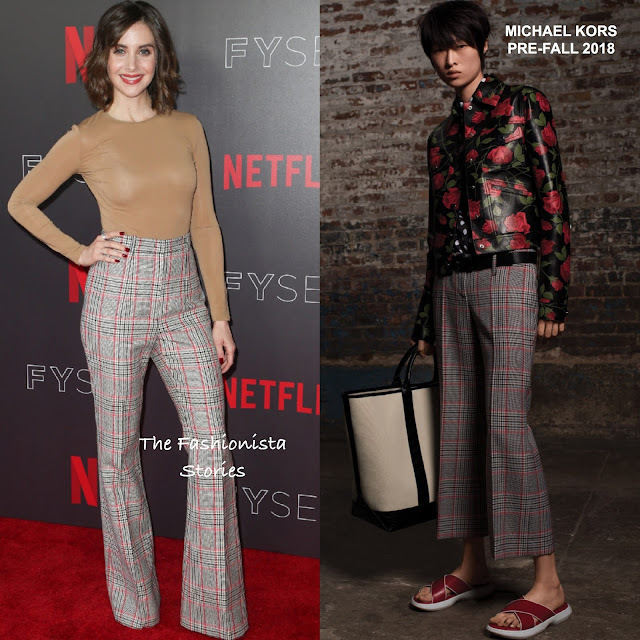 For the occasion, she wore a tan MAX MARA long sleeve knit top and MICHAEL KORS PRE-FALL 2018 plaid, wide-leg trousers. In the look book, Alison trousers were featured in a crop version but I prefer the long, wide-leg version. Although they are not visible, Alison is wearing red suede LK BENNETT platform which coordinates nicely with her ensemble. You can check them out via her intstagram. Side parted medium waves, red lips and a IRENE NEUWIRTH ring finished up her look.